Borges dreamed of the infinite book, and although I wouldn’t have taken the description to that metaphysical extreme, so do I. It’s easier to let that dream go now that I’ve gotten used to infinite network nodes and am never more than a couple of feet from an access point. But the electricity might go out, and then how could I feel both lost and safe in the spacious caverns of knowledge? 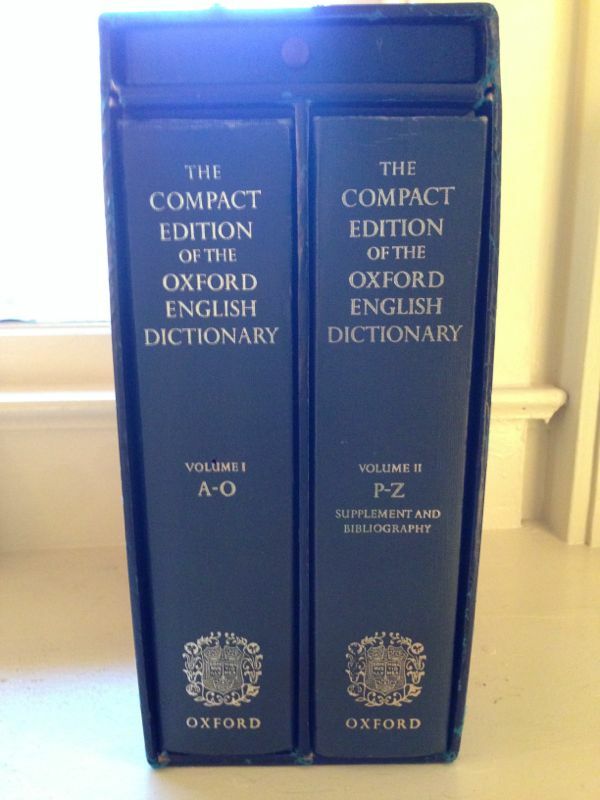 I’d bust out my compact OED, purchased recently for $20 (!!!) used. The magnifying glass wasn’t in the little drawer, though, which means I need to buy one before I and my two volumes of shrunken type are transported to that desert island. It’ll be nice to have after beepocalypse or whatever it is that ends up leading to the collapse of civilization by which is meant the internet. We can sit around listening to the victrola and looking up words if we have not starved to death etc. Oh, man. Things that worked in print that just aren’t the same otherwise: OED & the Reader’s Guide to Periodical Literature. Those two things were revelations when I first found out about them. I hardly use either now. $20. Hot damn. A steal. Drooling when I saw you found this. It’s a monument! Your home library is now legit. I want to add to Bryan’s list those giant volumes of yellow paper and metal covers (thousands of pages thick, they seemed) that used to be in the middle of record stores as a way to look up music by title, author, song, album . . . How often they must have had to add pages and reprint and update them. I fantasized about having one of those books. I have the extra special compact edition: all the words in just one volume. Unfortunately, it doesn’t come in a handsome case like the two-volume version does, so one either needs a bookshelf with very tall shelves or a convenient space in which to lay the book flat (and then resist the temptation to pile other stuff on top). What I really need is a dictionary stand. Congratulations on the find!